According to a recent report compiled by Transparency Market Research (TMR), the competitive landscape of the global smart locks market is prognosticated to show notable growth owing to the expansion of telecommunication networks and mobile computing devices. The market is estimated to expand at a remarkable rate within the next few years due to the surging focus towards investments of building smart city infrastructure that has aided the entire development of the smart locks market at a global level. Major players of the global smart lock market are Assa Abloy Group, Honeywell International Inc., Home Inc., Assa Abloy Group, Panasonic Corp., and Samsung SDS Co. Ltd. Major companies are investing huge amount of money into research and development activities in order to bring forth the progress of product development in the market. As per the TMR report, the global smart locks market is predicted to be worth US$ 1.01 bn between 2016 and 2024. The CAGR is estimated to be 18.30% by the end of 2024. Based on categorization by product type, the deadbolt segment is projected to hold large share in the global market owing to high product durability and low installation costs of the products. From a geographical perspective, North America is estimated to be holding a 33.6% share in the market with Europe competing closely. With the increasing prevalence of crime rates day by day, people all across the world are more concerned about safety and security at a personal level. The global smart lock market is being driven by factors like technological advancement and the rise in the number of crime rates. Moreover, the extensive usage of smartphone in the past few years have also fueled the smart lock market. 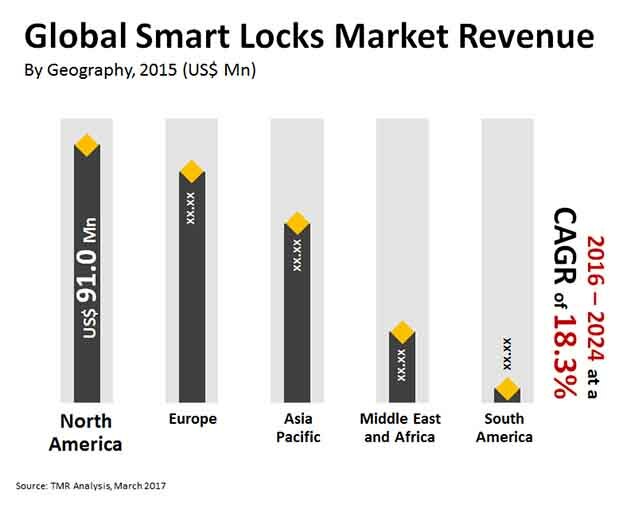 On the basis of geographical segmentation, the global smart locks market is categorized into the regions of North America, Asia Pacific, Middle East and Africa, Europe, and South America. Currently the market is dominated by North America and Europe. However, Asia Pacific may be anticipated to witness a rapid growth due to the emerging market especially in the emerging nations of India, Japan, South Korea and China. Another important factor accelerating the development of smart locks market is the reduction in cloud infrastructure as well as mobile broadband cost. The increasing escalation of cost-efficient, technologically advanced, and smart mobile computing devices, IoT solutions, Mobile technologies around the world is likely to bring lucrative opportunities in the growth and development of the smart lock market in the world. With the introduction of smart homes, the need for smart locks has also increased due to the tight security preference of people these days. The low cost of universal mobile broadband and cloud infrastructure is likely to encourage end users to monitor and control any kind of device efficiently irrespective of whether it is smart lock or a smart thermostat. With the implementation of smart locks, one does not have to go hunting fir keys in order to open doors. Smartphones will do the needful. The information presented in this review is based on a TMR report, titled, “Smart Locks Market (Product Type - Deadbolt and Lever/Knob; Unlocking Mechanism - Keypad, Touch Screen, App Based, and Hybrid/Integrated; Application - Government, Commercial, Industrial, and Residential) - Global Industry Analysis, Size, Share, Growth, Trends, and Forecast 2016 – 2024”.